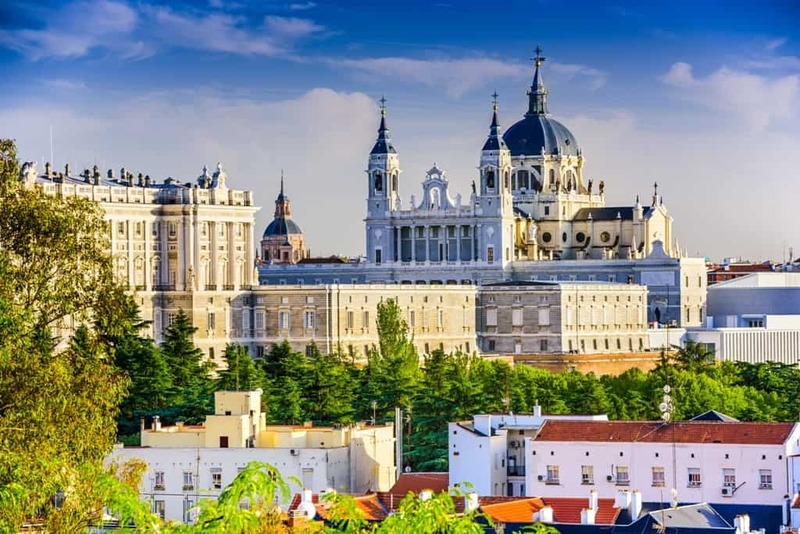 Madrid, Spain’s largest city and its capital, is one of the top travel destinations in Europe perfect for a 3-day trip. A vibrant cosmopolitan city pulsing with life and overflowing with energy, Madrid is more unique than its neighboring modern capitals. It is a city where old and new intertwine – where narrow cobbled lanes and bourbon squares from the 18thcentury end in skyscrapers and large plazas. 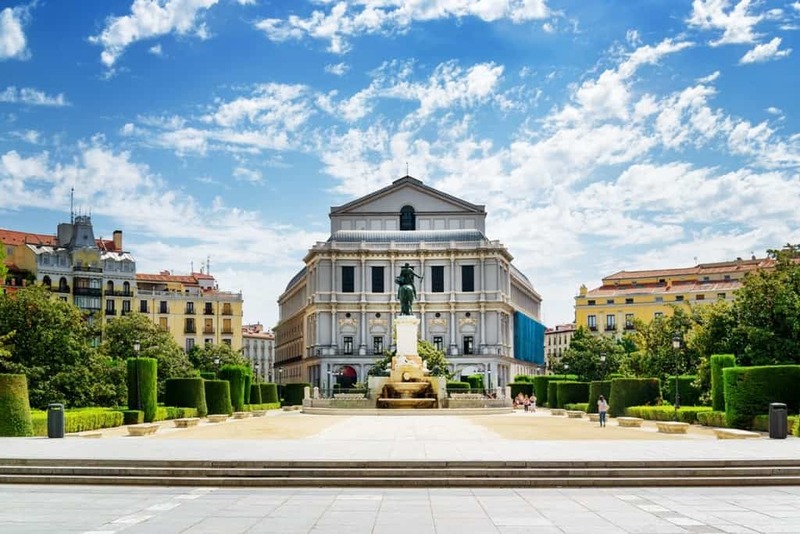 There is an abundance of gorgeous little neighborhoods to explore, world-class museums including El Prado, Reina Sofia and Thyssen, plazas, medieval buildings, narrow alleys, galleries, cultural institutions and much more. 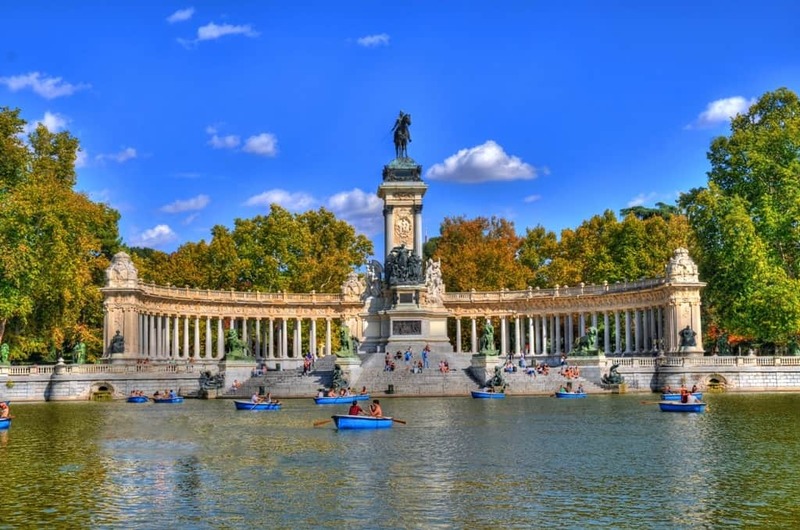 The intense vibrant energy of Madrid is captivating, as you’ll find yourself getting lost in one historical neighborhood after the other, and overwhelmed by the warmth of its locals, and the taste of its sangria. 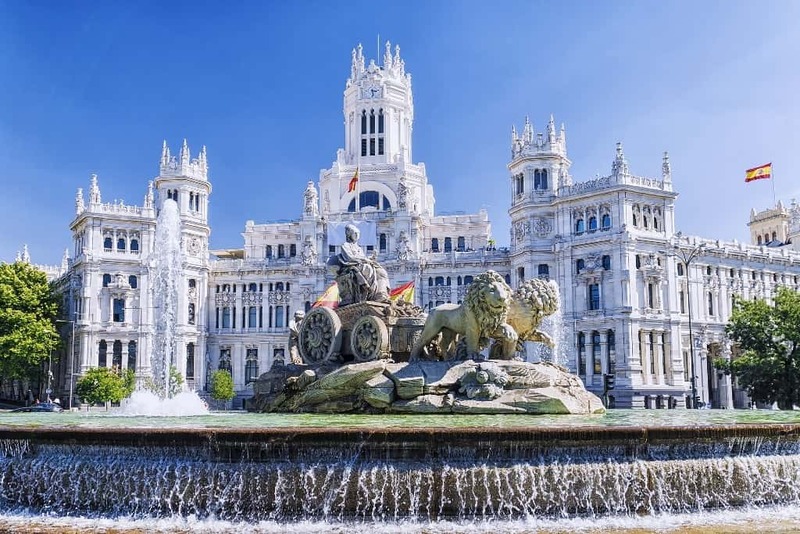 Madrid is the perfect weekend gateway as you can end up exploring the city’s main highlights in just three days, where you can take in all the city’s charm with its history and art in the morning and let the city consume you with its energy at night. With this guide you’ll be able to check out everything you need to see in Madrid in just three days! How to get from and to the airport of Madrid. Madrid’s airport Barahas is situated 12 km outside the city centre. The airport is the biggest in Spain and has 4 terminals all connected to each other by a 24-hour free bus service. Here is how you can get from the airport of Madrid to the city centre. The easiest and most comfortable way to get to the city centre is by a reliable transfer service like KiwiTaxi. You can book your transfer online before your departure and a driver will be waiting for you at the arrivals. He will take your luggage in the luxury car and drive you comfortably to your destination. Trip duration up to 30 minutes depending on traffic. You will find taxi stands ouside all the airport terminals. Always use the official taxi services and do not take offers from drivers inside the terminal. Trip duration up to 30 minutes depending on traffic. You can also try an alternative to a taxi the Welcome Pick Ups. It costs exactly the same as a regular taxi, only now you will have already prepaid for it, your driver will be waiting for you at the arrivals hall holding a sign with your name on it, a bottle of water and a city map. You will not have to worry at all about the language as all drivers speak English. There is a fixed price of 35 € each way. 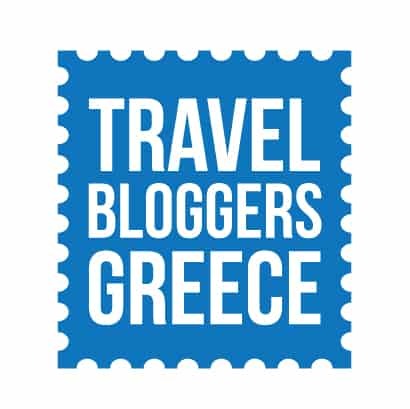 Click here for more information and to book your trip. The yellow airport express bus runs 24 hours a day, 365 days per year. You can take the bus from terminals T1, T2 and T4 and the ticket costs 5 euros. The journey takes aproximatelly 40 minutes and the bus makes only 3 stops along the way, the corner of O’Donnell and Doctor Esquerdo, Plaza de Cibeles and Atocha train station (from 6:00 am until 23;30 pm). You can take metro line 8 from all the terminals of the airport and head to Nuevos Ministerios station at the center of Madrid. From there you can hop to another metro line until your end destination. The journey until the Nuevos Ministerios station is 15 minutes and the metro operates daily from 6:00 am to 2:00 am. 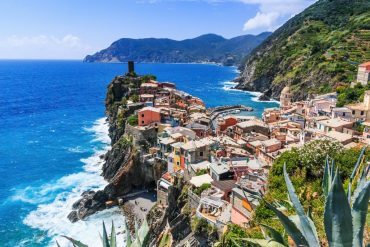 Tickets can cost up to 5 euros depending on your end destination. 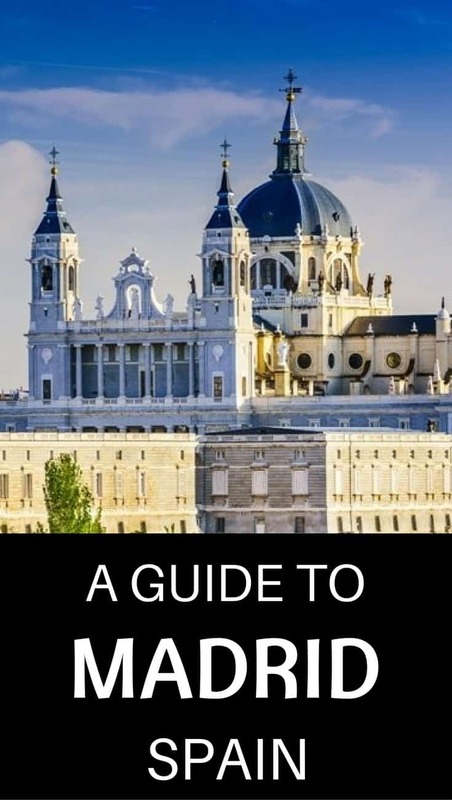 You might be interested in: Useful tips before visiting Madrid. 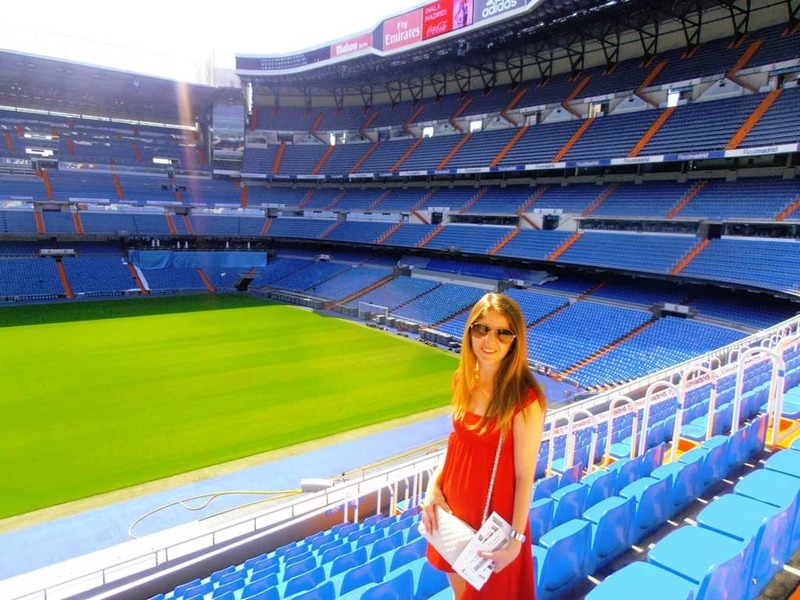 Here are my favorite accommodation options in Madrid. 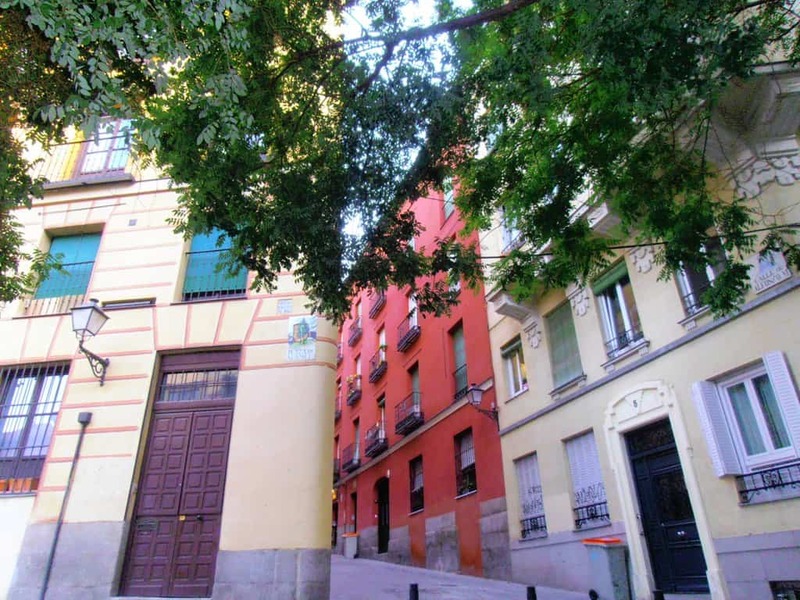 Francisco I is located 250 m from Plaza Mayor and Puerta del Sol. It offers simple rooms with private bathroom, TV and free Wi-Fi. 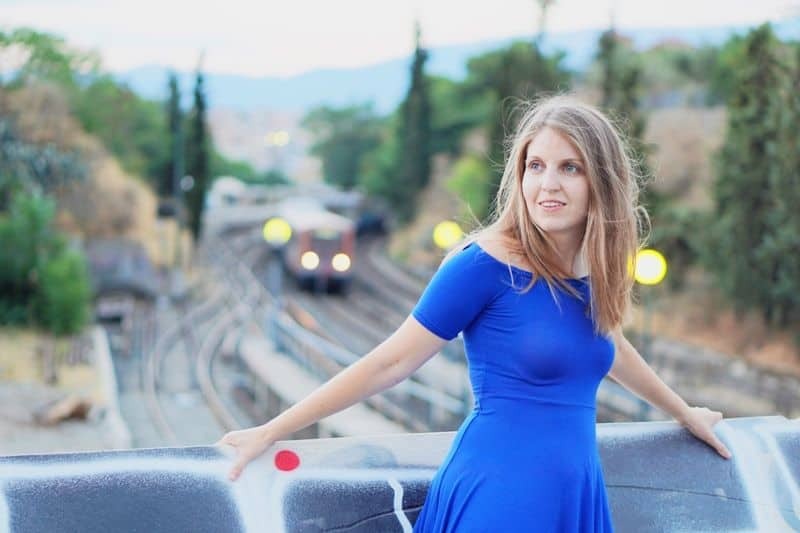 Room Mate Laura is centrally located 350 m from Puerta del Sol and the Royal Palace. It offers a range of accommodation options (double rooms, family rooms) all with satellite TV, free Wi-Fi and air-condition. Hostal Central Palace Madrid is centrally located and overlooks the Sabatini Gardens in Madrid’s Plaza de Oriente. Rooms have free Wi-Fi, toiletries and a flat screen TV. Breakfast is served in a nearby cafe. Hotel Círculo Gran Vía, Autograph Collection by Marriott is an adults only hotel located in Gran Via just 400 m away from Puerta del Sol. It offers stylish rooms with air condition, flat-screen TV and coffee facilities, bathrobes, and toiletries. Other hotel amenities include a restaurant, bar and business facilities. Gran Meliá Palacio de los Duques – The Leading Hotels of the World is a luxurious hotel located 300m away from the Royal Palace. It offers elegant rooms with 49-inch LED-TV, iPhone docking station, Nespresso coffee machine and free WiFi. Bathroom amenities include a rain shower, bath, heated floors, and Clarins toiletries. On site there are 3 restaurants, a coctail bar, a tea corner, a Thai Room wellness center and a 24-hour gym. Plaza España is a great base to start from, as it’s one of Madrid’s busiest traffic intersections and one of its most symbolic squares. 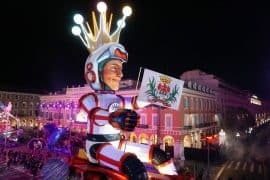 It’s worth checking it out since the square itself dates back to the 18th century and is a sight to see – and also due to its proximity to all the famous sights and attractions you’ll be checking out for the rest of the day. 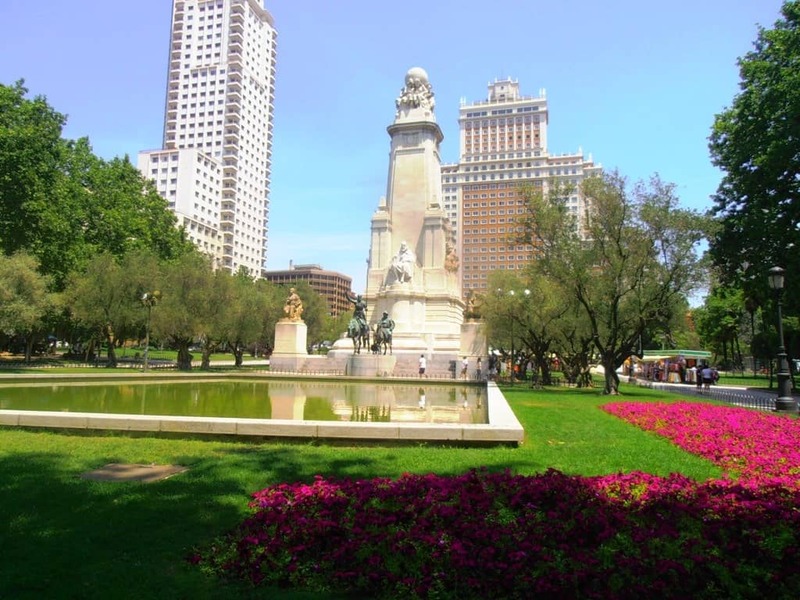 The square features a large monument to the famous Spanish novelist, poet and playwright Miguel de Cervantes Saavedra which was built in 1925 and consists of a stone sculpture of Cervantes that looks over sculptures of both Don Quixote and Sancho Panza, a fountain and a pond. The whole plaza is bordered by two of the city’s largest buildings, the Torre de Madrid – one of the tallest skyscrapers built in 1957 and The Edificio España. Near to the plaza you’ll find movie theatres, parks, restaurants and Templo de Debod. Now you’ll reach the hustling and bustling part of Madrid and its city center. This is one of Madrid’s most famous tourist streets so expect it to be packed all year long, and even more so in the summer months. Stop and admire the incredible “edificio” of the buildings with their Art Nouveau and Art Deco facades, and take in the pulsing energy emitted from this huge street. 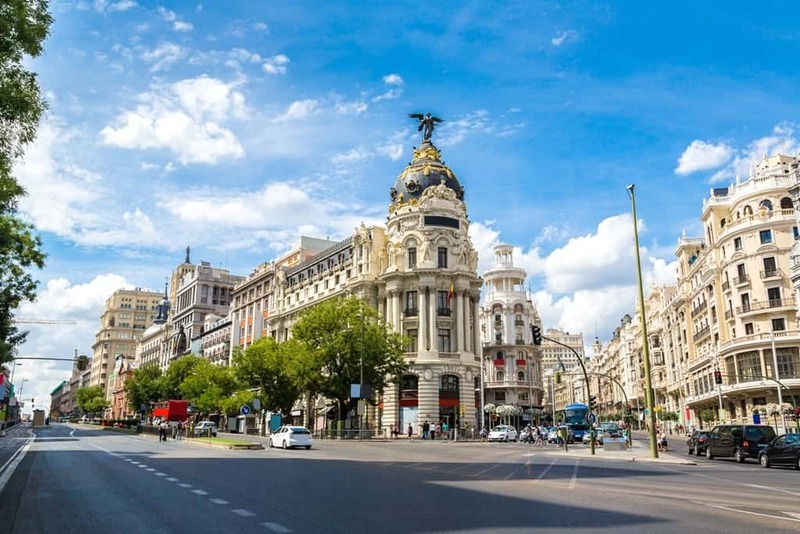 It was called “Madrid’s Broadway” many times and you’ll understand when you see the huge screens, the mixture of elegance and modernity, the vibrancy of the shops, the cinemas, the cafes and of course – the majestic buildings. The most eye-catching buildings of them all are Edifico Carrión and the Telefónica buildings. 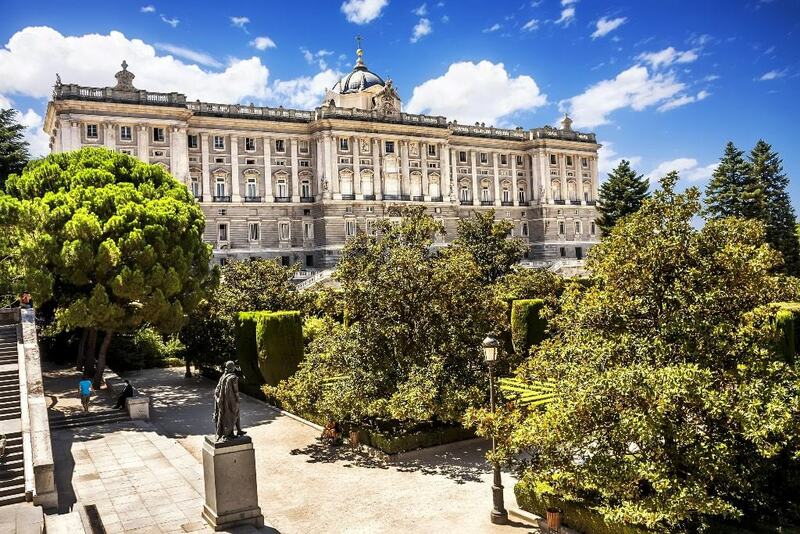 El Palacio Real or the Royal Palace, is Madrid’s largest building and most definitely its most elegant, it is also the largest royal palace in Western Europe. Initially designed by Fillippo Juvarra, the palace was constructed mainly from stone and overlooks the hills to the west of Madrid. 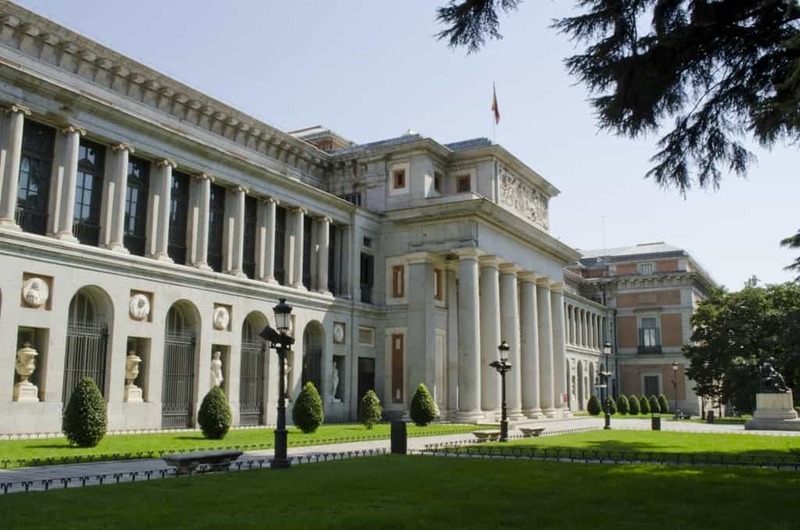 Not only is it an astounding palace, but it’s also one of Madrid’s most important museums. The palace is compromised of 3,418 rooms and the official tour (or even the self-guided tour) will lead you through 50 of the palace’s rooms, which exhibit proudly the richness of the Spanish culture. As you enter, you’ll find the main vast staircase standing proudly and from there you can end up exploring the main state rooms, the Hall of Halberdiers, the Hall of Columns, the Hall of Mirrors and King Charles III’s room. The most important highlight, however, is the Royal Armoury, which you can visit through a separate entrance and includes an incredible collection of armor – some of it actually worn by Charles V. You’ll also find valuable tapestries, furniture, ceramics, and works of art by Velazques, Goya, Giordano and Mengs! Oct – March: Mon-Sat from 9:30 am to 5 pm. Sundays from 9 am to 2 pm. April – Sept: Mon to Sat from 9 am to 6 pm, Sundays from 9 am to 3 pm. Right in front of the palace is the Plaza de Oriente, which is a beautiful square you can have some peace and tranquillity. The semi-circular design is lined by plants, trees and walkways along with statues of Spanish kings. There are statues of over 44 Spanish monarchs, ranging from the Gothic period until the 15th century and an equestrian statue of Philips IV. 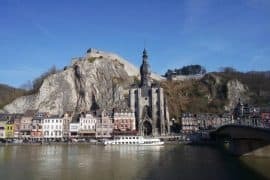 You can also check out the Café de Oriente, where you can sit by the terrace and enjoy the views of the scenic square right next to the Royal Palace and the Royal Theatre. This perfect quintessential neighborhood is among the most traditional and authentic Spanish ones in Madrid. Lined with jam-packed bars and restaurants, terraces, venues and traditional taverns, this neighborhood is the perfect place to stop by for a drink or tapas. 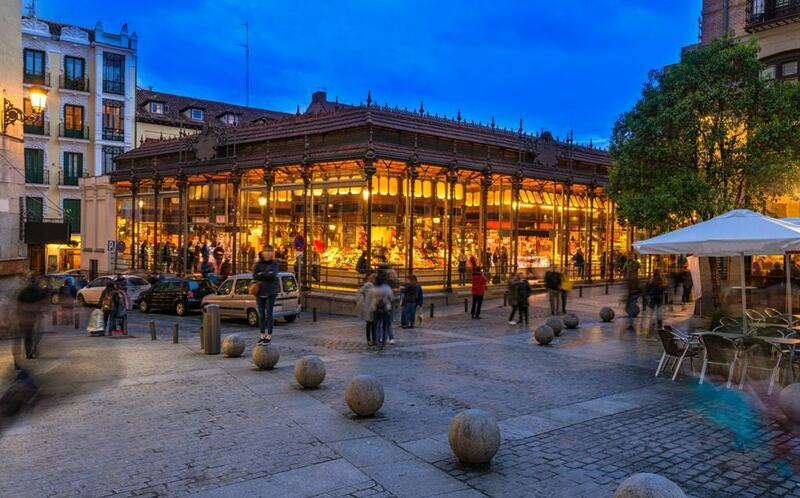 There you’ll also find El Mercado de la Cebada, which is one of the biggest markets in Madrid. 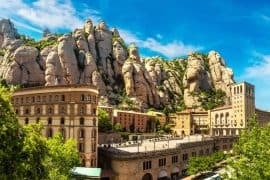 You’ll not only stumble upon the perfect tapa bars, but you’ll also find little churches, basilicas and museums hidden in the narrow streets of the neighborhood. Check out El Grande Church, San Pedro El Viejo Church, Plaza de la Paja and Principe de Anglona Garden. For the perfect Spanish food experience, do not miss out on Cava Bajais. If you happen to be in Madrid on a Sunday, do not miss out on the largest open air flea market located in the heart of La Latina. It’s open every Sunday from 10 am to 3 pm and it’s the perfect place to go treasure hunting for the perfect antique, clothing, second-hand clothes, costume jewelry, vinyl records, and all the live performances! 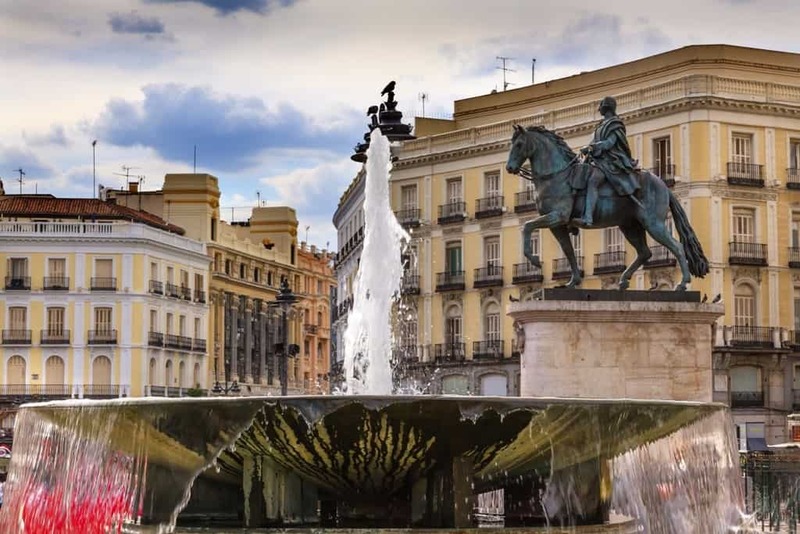 Puerta del Sol is definitely worth checking out before heading to the other different monuments and is also a great place to spend your evening. It’s the most famous central square in Madrid, and is considered the nerve center of the city. It is pedestrian friendly and all the nearby parks, shops, bars, restaurants and museums are super accessible from there. This square had a city gate with an image of the sun, hence the square’s name – the Sun Gate. Not only this, but you can take a picture where the country’s kilometer 0 is marked, check out the equestrian statue of King Carlos III and the beautiful Casa de Correos. 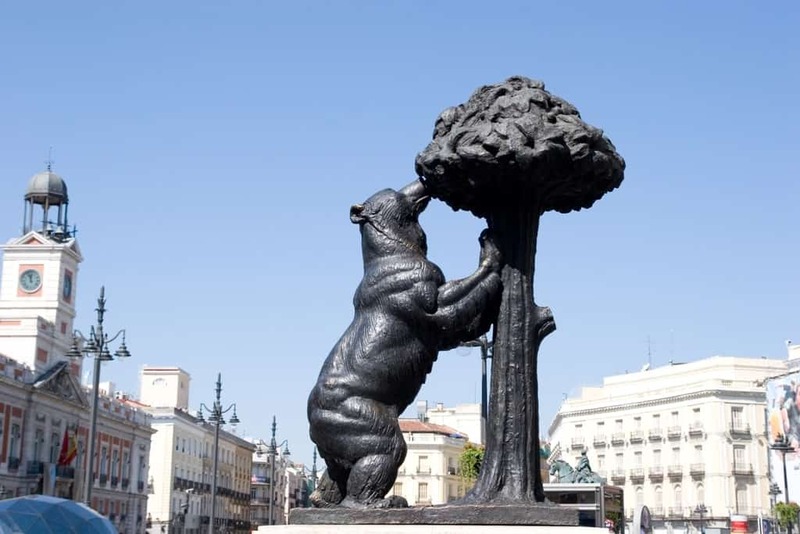 One of the most famous symbols of Madrid also lies in Puerta del Sol – El Oso y El Madroño that is a 20 ton statue of a bear eating fruit from a tree. 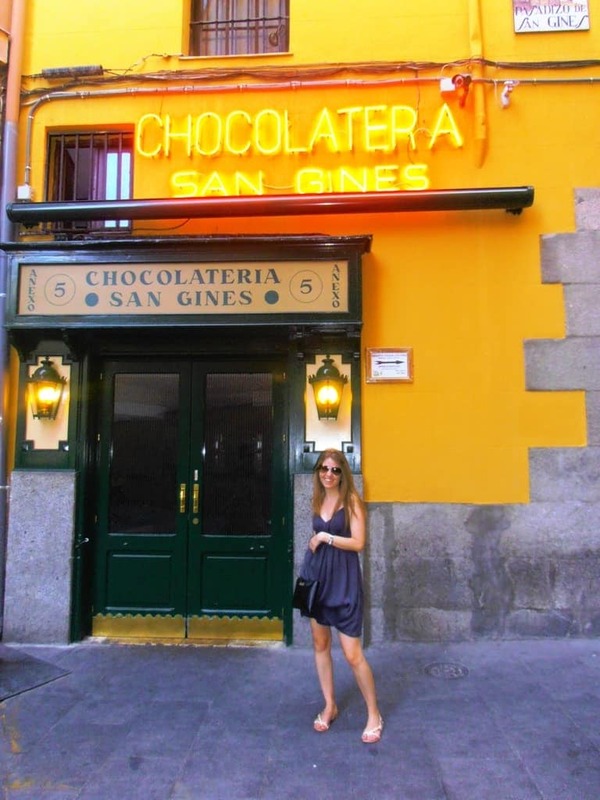 You cannot be in Puerta del Sol, or all of Madrid actually, without stopping by Chocolateria San Gines. It has been around since 1894 and still looks the same from a century ago and it’s open 24 hours a day! Enjoy the traditional Spanish dish (that is supposedly only eaten for breakfast but who puts the rules!) consisting of rich and smooth chocolate into a cup where you can dip your churros in, and hot chocolate. This old historic rectangular square is in the square of the city, and has more than four centuries of history. It’s this perfect portico lined square with charming little shops and cafes where you can sit and have a café con leche while taking in the view and the live performances. The square has 9 entranceways and is usually the Spanish gathering place where you can gaze at the beautiful architecture and the detail in all the buildings. You can then choose to explore one of the narrow alleys and passageways that will take you right back to Old Europe. This beautiful traditional iron structured market is the only one of its kind surviving to the present day. 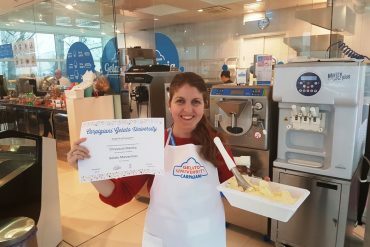 It will take you through a journey of Spain’s gastronomy scene as it’s one of Spain’s most important markets that reflect the culinary culture of the country. 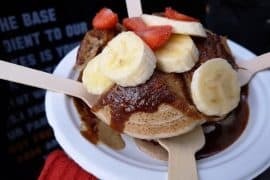 You’ll not only find dozens of stalls with different types of food, but also courses, launches, fairs, wine bars and of course – delicious tapas. The 20th-century glass walls give the perfect backdrop to the beautifully designed stalls where you can check out vegetables, tapas, dried pasta, oysters, and lots of glasses of champagne. You cannot visit Madrid and Spain without attending a flamenco show. Flamenco is considered the most famous art form in Spain. 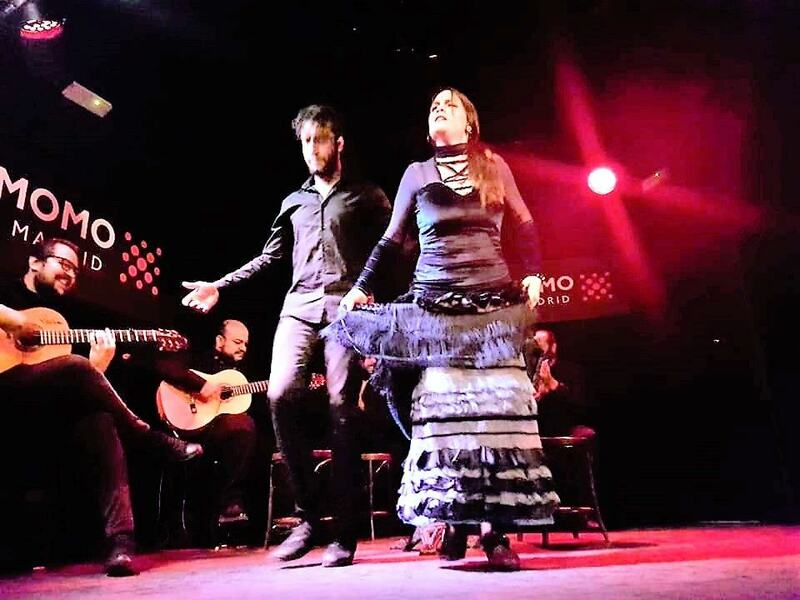 Finish your second day of your trip to Madrid by attending one of the best venues for flamenco in Madrid. Apart from the show, a dinner and tapas menu is offered. We opted for the tapas menu and had a delicious spanish potato omelette and a plate with Iberian cured ham and mature sheep cheese that we accompanied with red wine. The performance lasted one hour and it was very emotional and intense. It was my first live performance of flamenco and I absolutely loved it. At the entrance of the venue there is also a small interactive museum dedicated to flamenco. Walk of Argentina or the Walk of Statues which is a promenade of statues of different monarchs who ruled Spain. Jardines de Cecilio Rodriguez: an enclosed garden with a lot of peacocks. Museo del Ejercito which showcases Spain’s military history. You can also rent a rowboat and paddle around the lake while taking gorgeous pictures or feeding the fish. 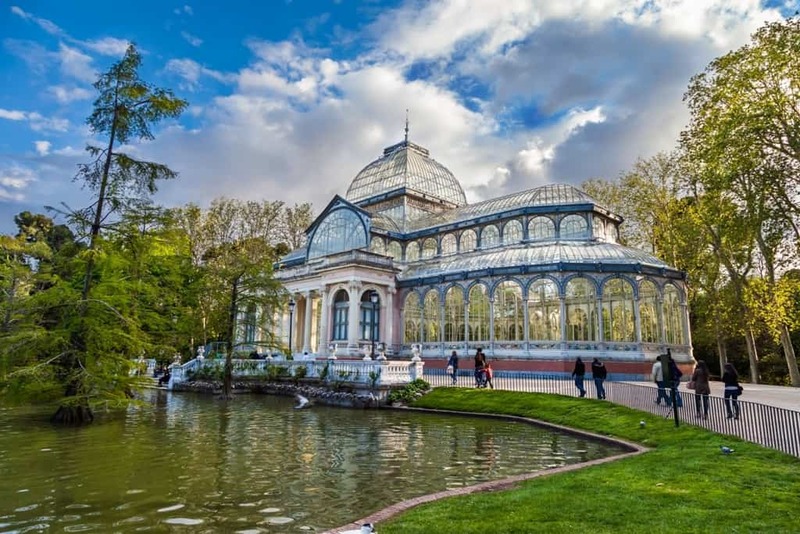 This building is right in the middle of Retiro park, and is one of the most iconic buildings you’ll find in Madrid. Made entirely in glass, you will be mesmerized by the image of the sunlight streaming through a glass creating an almost otherworldly vibe throughout the whole place. The building is surrounded by a small lake where frogs and ducks add to the fairytale vibe of the whole area. It was originally used to house some rare and exotic fauna, but right now is used for contemporary art exhibitions inside this incredible glass structure. Mon – Sat from 11 am to 8 pm. Sunday: 11 am to 6 pm. Reina Sofia is located on the Art Walk and the museum was, in fact, a former hospital. The museum itself is huge and consists of 20,000 works of art and houses the timeless masterpiece by Picasso – the Guernica. There are works of art by Dalí, Miró and Juan Gris too. You’ll take a journey through the history of Spanish contemporary art as you go through the different floors as the artwork there ranges from works from the 1900’s until the 20th century. ‘From Revolt to Postmodernity (1962-1982)’. Not only this, but you’ll find workshops, seminars, video cycles and conferences as well, along with a beautiful library and a café-restaurant. 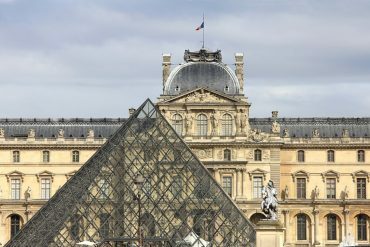 What’s incredible about this museum is the breadth of the collection of European art that it has, it’s the perfect place to immerse yourself in all types of artworks from all different centuries, the museum has them all under one roof. There are over 1000 paintings ranging from the 13th century Italian Gothic movement, to the 20th century American pop art movement. It’s advised to start from the top floor and then work your way down. On the 2nd floor you’ll find medieval art and Italian, German and Flemish religious paintings, then on the 1st floor you’ll find works by Monet, Pissarro, Sorolla, Picasso, Juan Gris, and Sisley and much more. On the ground floor, you’ll be sent back to the 20th century with pop art and modern paintings. Tuesdays to Saturdays- 10 am to 11 pm. This is definitely one of the most important museums on anyone’s travel to-do list for Madrid. You’ll find an incredible display of works by the greatest European masters everywhere from Velazques, Goya, Rubens and Bosch! The building itself is a great example of 18th century neo-classical architecture and was transformed into a museum in 1819 with over 8600 paintings and 700 sculptures. You cannot miss out on this incredible cultural sight with its paintings, sculptures and great art galleries – and of course, the sheer scale of the collection available. Las Meninas and The Triumph of Bacchus by Velazquez. The Naked Maja by Goya. The Garden of Delights by Bosch. ‘The Nobleman with his Hand on his Chest’ by El Greco, Room 10. 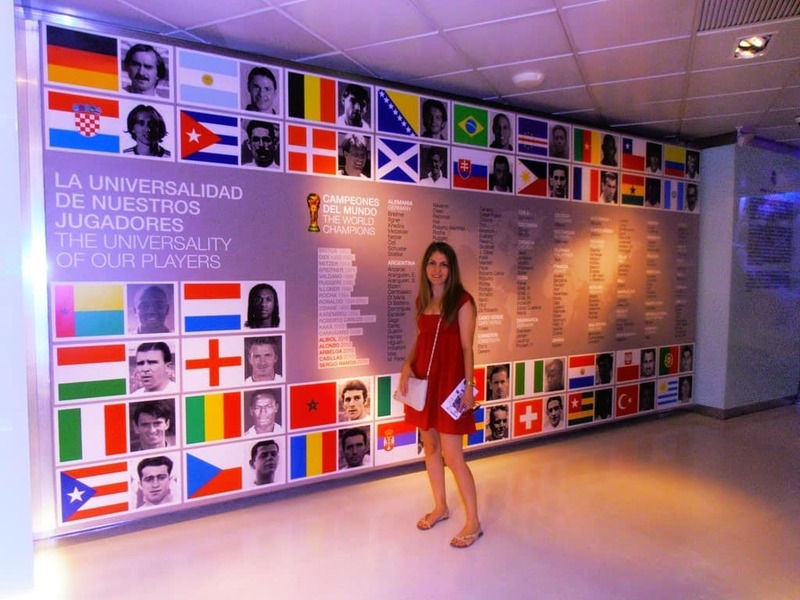 This is a top-UEFA classified elite stadium and an essential visit to every football fan from every part of the world. You will have unlimited access to every part of the stadium – from the locker rooms to the benches, the pitch, the presidential box, the coach’s viewpoint, and you’ll be able to get a panoramic view of the whole stadium along with visiting the museum which houses an exhibition of the trophies and a quick journey through the history of Real Madrid. Monday to Saturday: 10:00 to 7 pm. Sundays and Holidays: 10:30 to 6:30 pm. Toledo and Segovia day trip. Explore the main attractions of Toledo and Segovia in this full day tour that includes tickets to the Alcazar of Segovia. Toledo day trip. If you are only interested in exploring Toledo this day trip from Madrid is perfect for you. Avila and Segovia day trip. Explore the beautiful towns of Avila and Segovia with this day trip from Madrid. 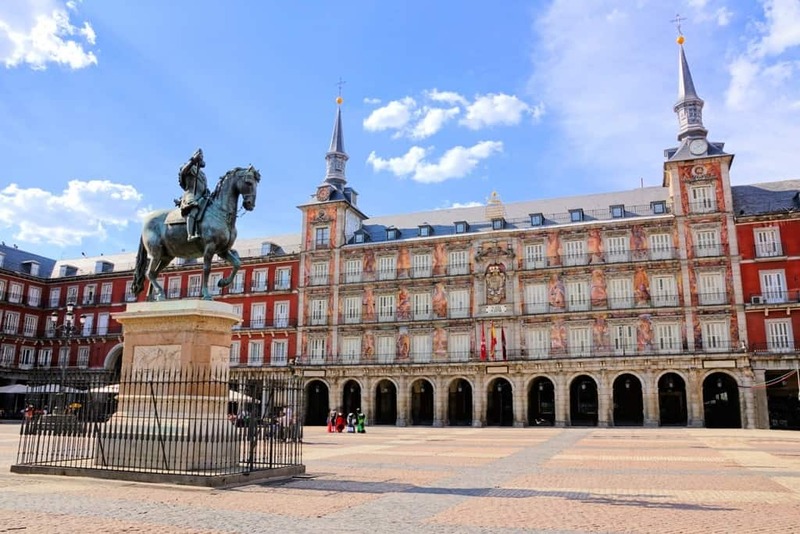 And by that, you would have smartly used your three days in Madrid the right way and got a taste of its culture, its history, its plazas, its architecture, its busy mornings and its vibrant nightlife. Of course, spending three days in Madrid might not be enough to take in all of the city, but it’s definitely enough to fall head over heels for this Spanish capital. Have you been to Madrid? 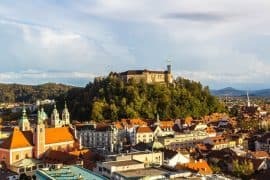 Do you have anything to add to this 3-day itinerary? I would like to suggest adding the Temple of Debod to the list of places to visit in Madrid. Thank you, Edmund, for the suggestion. I am going to Madrid at the end of the month. 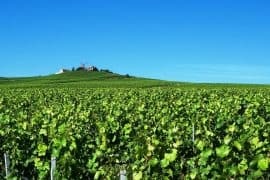 I will definitely visit and add it add it to my post. What a great post!! I have such fond memories of the Parque Retiro. When I visited Madrid many years ago I decided this park was going to be my spot for 3 days and finished reading a book. Loved it! So pretty! Thank you Jessy. Retiro park is very beautiful. Great post! I found it really useful to plan my city break to Madrid! Thank you, Maria. Happy to help. You are totally right about the Bocadillo de Calamares. Happy to have helped! Have fun in Madrid and if you have any questions let me know. Thank you so much. Visiting Spain for my first visit in September. I appreciate your suggestions! Thank you for your comment. Have an amazing time in Spain. Thank you so much for all these valuable tips. My spouse and daughter will be visiting Spain for the first time next week. You are awesome for sharing your magical experience with us. Thanks for your lovely words. I wish them a great journey. Amazing ideas!!! Will consider in for my trip!! !